Roughan or Rogan means Clarified butter/ghee or oil in Persian, while Josh means to stew or braise. 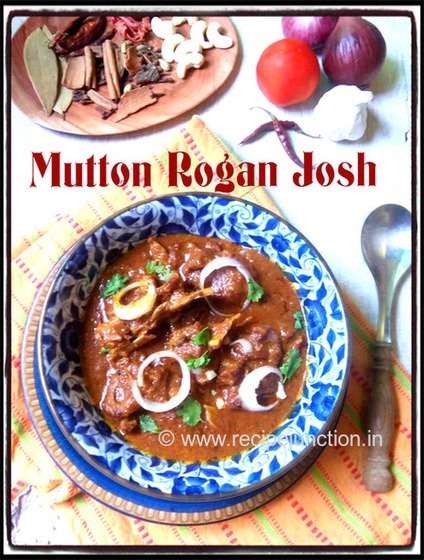 Rogan Josh, by its definition means stewed or braised in ghee or oil. 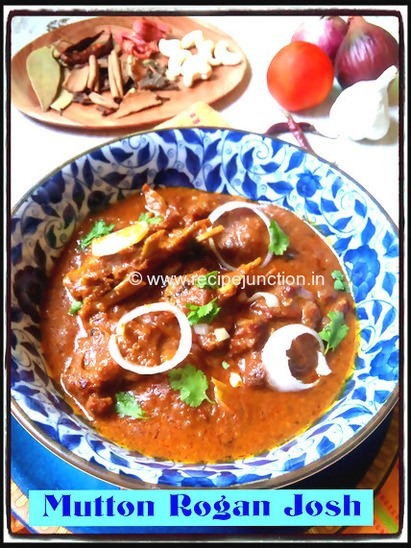 Rogan josh thereby basically is braised lamb chunks cooked with a gravy based on browned onions or shallots, yogurt, garlic, ginger and aromatic spices (cloves, bay leaves, cardamom and cinnamon, jawitri etc.). Its characteristic brilliant red color traditionally comes from liberal amounts of dried Kashmiri chilies that have been de-seeded to reduce their heat, these chilies are considerably milder than the typical dried red chillies of Indian cuisine. While the traditional preparation uses whole dried chilies that are de-seeded, soaked in water, and ground to a paste, non-traditional short cuts use either Kashmiri chili powder (available in Indian stores) or a mixture of paprika (predominantly) and cayenne pepper, adjusted to taste. In India, rogan josh is often made with goat meat instead of lamb, since genuine lamb is less available than goat meat. There is a variety with beef as well. Traditionally, Rogan josh is slow-cooked over a longer period of time on low heat, but this slow-cooking is not always a great option when you have less time in hand. I tried another adaptaion of recipe which came out really well and I enjoyed it and guarantee you all will like it too. 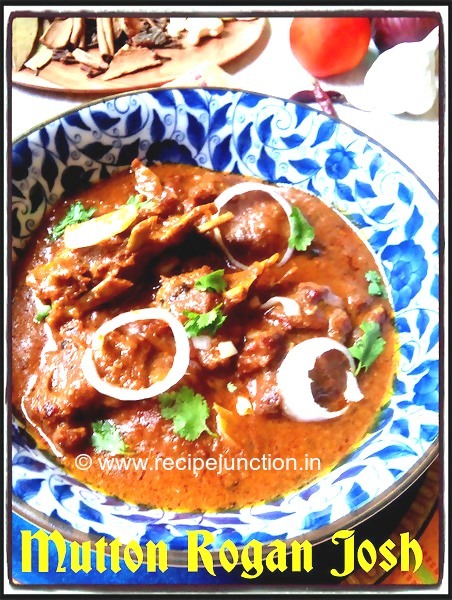 You do not need much ingredients for this dish and it gives an aromatic meat dish which goes very well with roti, paratha or rice. Kashmiri Red Chilli powder : 1 tbsp. Shahi Garam Masala powder : 1 tbsp. Prep 1 : Wash, drain and marinate the mutton pieces with salt, 1 tbsp. of ginger-garlic paste and 1 tblsp. of yogurt. Keep aside for an hour. Prep 2 : Roast cashew nuts on a heated tawa till they are lightly brown, cool and make a paste using little water. Prep 3 : Blanch tomatoes till they are soft, remove the skin and make a puree. Heat oil and ghee in a heavy-bottomed pan, lower the flame and temper with whole garam masalas (do not let them burn) one by one, when they start to splutter, add sliced onions. Saute till they start to change color. Add marinated mutton pieces in there and saute on high heat for 5 minutes. Add ginger-garlic paste, reduce heat and add the coriander, chilli, cumin powder and 1/2 of garam masala powder. Saute for 2 more minutes, then add cashewnut paste, tomato puree and saute till oil separates. Add 3 cups of water and let it cook till mutton is done. You can cook mutton on the same pan, it will take time, or you can pressure cook the meat also, which I have done to save my time. What I do, I pressure cook the mutton till they are just done, then pour the meat with gravy to the previous pan again and cook for another 20-25 minutes or till they are nicely cooked. This way, meat gets cooked quickly and flavours also goes inside the meat and it also saves a lot of time. Whisk the yogurt, add to the mutton. Add rest of the garam masala into the gravy. As soon as it starts boiling, remove from heat. Serve with anything of your choice - Veg Pulao, Reera Rice, Roti/Chapati, Paratha or Naan. You'll love this royal dish anyway.................Bon Apetit!!!! !